Invited by the Hungary Contemporary Architecture Center, Failed Architecture conducted a four day workshop on a late-socialist department store and office complex. Architecture built under ‘socialist’ regimes suffers from stigmatization. It is often perceived as built without consideration for the urban context or it is argued that its physical appearance does not match contemporary taste. Office space built in those societies is generally seen as unsuitable for modern business, which often leads to vacancy and decay. However, to further our understanding of the architecture built under ‘socialism’, more nuanced approaches are needed that also take into account how its spatial legacy has evolved over the years in many complex ways. As the Hungarian Contemporary Architecture Center is keen to improve knowledge of this legacy, especially in relation to the rampant vacancy problem in the city, the center has invited Failed Architecture to conduct an intensive four day research workshop on a striking example of architecture from these times. Budapest’s Skála Metró was built during the last few years of ‘socialism’ as a department store and office complex and is centrally located next to one of the city’s main train stations and a metro station. The workshop kicked off with a thorough exploration of the building and its surroundings, after which the participants started their analysis in the Rögtön Jövök gallery in central Budapest. This vacant shop space will in the near future become the main base for the Lakatlan vacancy project of the Hungarian Contemporary Architecture Center, and was brought back in use for the first time in years for the Failed Architecture workshop. The participants, mostly students and early career professionals in architecture, urbanism and related fields, worked for four days using the Failed Architecture research methodology. Following this methodology, participants were divided over 5 groups, each of them conducting an analysis of the building and its surroundings from a different perspective. These perspectives are the built environment, the social context, the economical situation, political conditions and the reputation of the building. 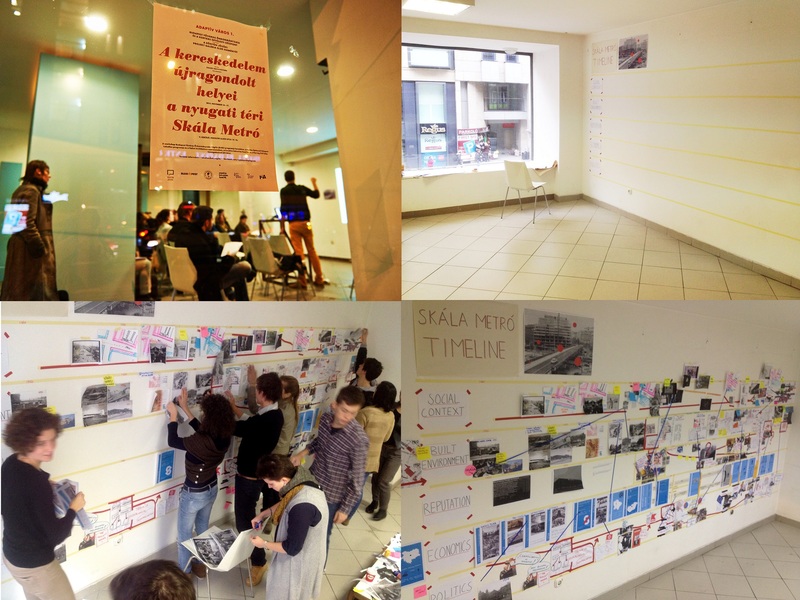 Every bit of information gathered by the groups was put on a five meter wide, physical timeline, which at the end of the workshop provided a detailed and nuanced image of the development of the Skála Metró over time. Proceedings of the workshop. Lectures, discussions and timeline construction. 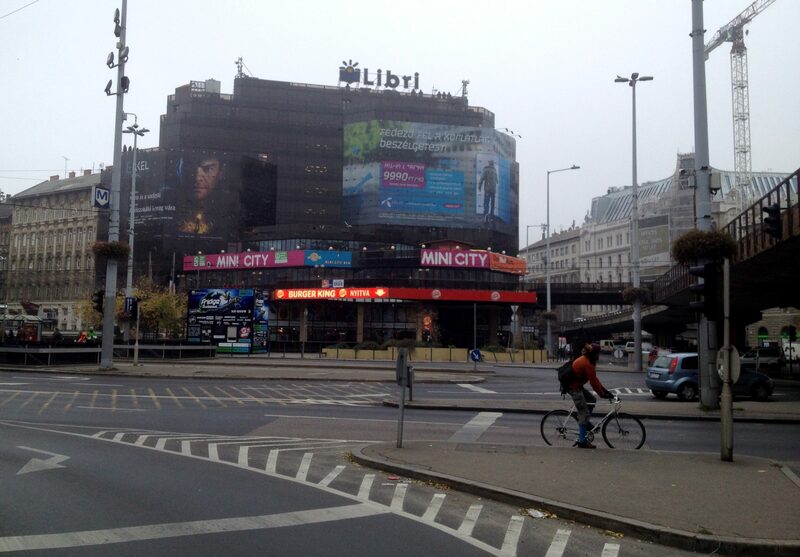 The location where the Skála Metró is standing nowadays became available after the London Hotel was damaged in the 1956 uprising. In the years that followed, the ‘socialist’ regime worked on consolidating their power, which from the 60s onwards included the introduction of a New Economic Mechanism. In this climate the first state owned ‘Skála’ department stores were opened all over the country. Plans for a new franchise on Marx Square in central Budapest were made in the late 70s, for which Kövarj György made a striking design. This Hungarian architect had worked on various train stations across the country before and as the headquarters of the Hungarian Railway Company (M’AV) were to be located in the same building as the shopping mall, György was asked for the job. Skála Metró, shortly after completion. 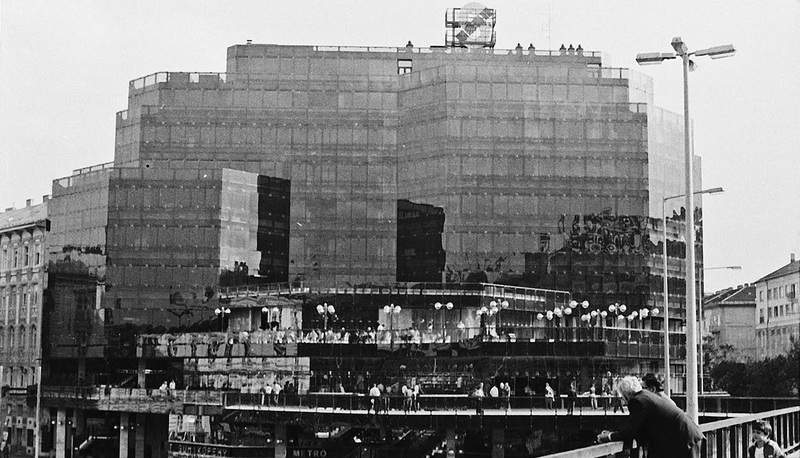 In 1984 the nine-floor, dark-glass building was officialy opened in the presence of the president János Kádár and various foreign officials. The complex contrasted with the urban fabric as it was clearly higher than adjacent buildings and as its widening lower floors flowed over into terraces hovering over the surrounding public space. Right from the start, the Skála Metró was famous for its wide range of unique luxury goods on offer, which were widely advertised on radio and television. It also provided more affordable products and housed a grocery store, which made it become a place to go to for virtually all Budapestians. Skála used the architecture of their Metró department store in advertising – unusual for that time. After the regime change in 1990, the department store section of the Skala Metro was privatized and sold. At the same time, shopping malls built with foreign investments were allowed to open their doors, and did so from the mid-90s, which quickly led to the decline of Skala’s status. By the time M’AV left the offices of the upper six floors in 2006, the shopping mall was run by Chinese retailers and not much was left of its 80s’ heydays. Marx square, in the meanwhile renamed to ‘Nyugati Square’, saw an influx of homeless as well as commuters from the new suburbs. A year later, with the building only occupied for 55% (with all office space vacant), the real estate investor and business man Akos Balogh bought the place. He didn’t set out to develop a holistic plan for the entire building, but started with allowing a club to open on just one of the empty office floors. While this was an instant success, its regular nights came to an abrupt end after three people died in a stampede not much later. The floors above the shopping mall were empty again, but not for long. In 2010-2011 the owner started to renovate the office floors and moved various of his own enterprises in the cultural sector to the building, such as a publishing house and various music websites. Recently, also a small theme park called Mini City (“for creative kids”) was openend on the third floor, attracting a more diverse crowd of families to the building. 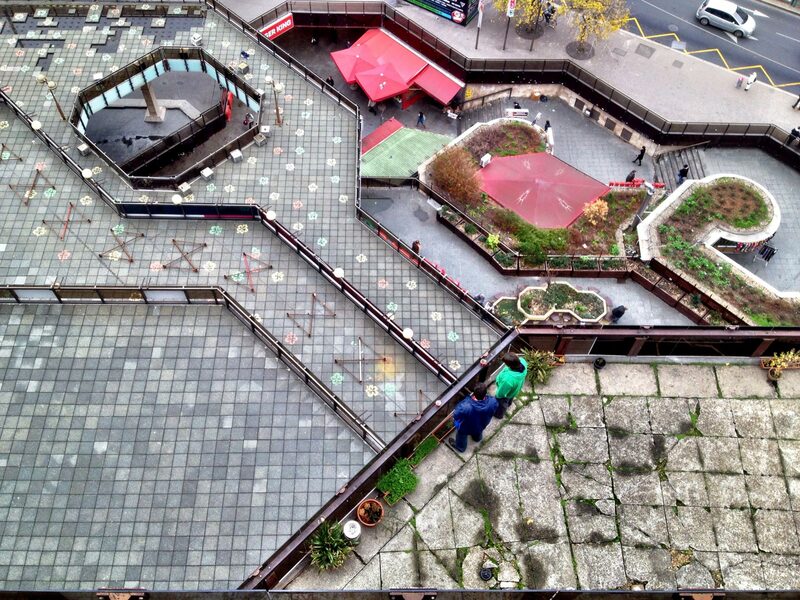 Skála Metró’s terraces and public space below, seen from the building. Clearly, the building is undergoing a ‘process of revitalization on the inside, but not on the outside’, as one of the workers of the publishing house told the participants of the workshop. Indeed, to passers-by it is unclear which changes are taking place behind the light-absorbing façade. The terraces of the first few floors, for example, are currently closed, suggesting the building is still empty. In particular the terrace leading to the overpass is in a bad shape and offers a dreary sight from the street level as well as from the building itself. Also the immediate surroundings of the building find themselves in a problematic state. The terraces offer shelter to large group of returning homeless people and the traffic situation is chaotic. Also the wild assemblage of small kiosks, food stalls, the octagonal concrete structures for greenery, the stairways to the metro station and the large advertisements make the square in front of the building a messy and confusing place. A soon to be realised redesign of the square and a new, local ‘law against homelessness’, although in itself a problematic development, will probably give the area a totally different feeling in the years to come. 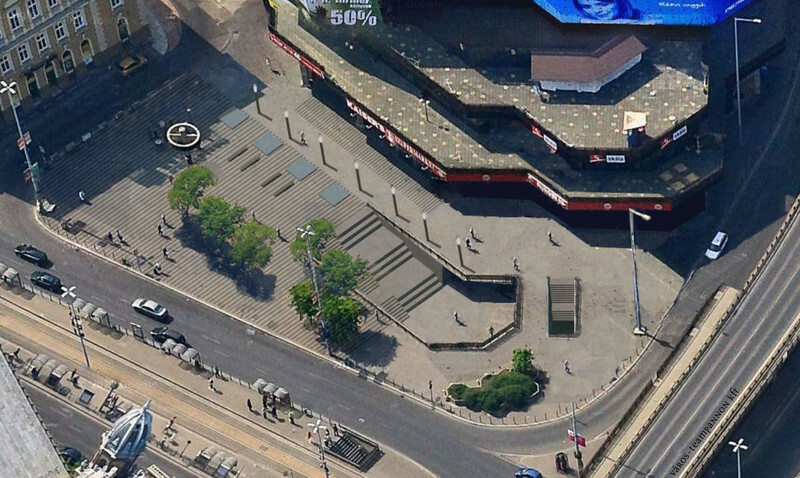 New plans for the public space, which are likely to be carried out to a large extent. The Skála Metró is not only a very young building, turning only 30 next spring, however it appears that in many ways it is actually a rather good building. Although the aesthetics of its exterior might not please fans of Budapest’s more traditional architecture, its structure as well as all technical installations are in a good shape. Also, the interior has proved itself to be highly flexible, as every floor can be easily converted from one kind of use to another. Furthermore, its location on a main traffic and public transport junction in the center of a major European capital is excellent, and the size of the building makes it suitable for a wide range of possible uses. However, more than getting some high scores on various characteristics, the Skála Metró has just been very lucky with an investor that seems to appreciate the building and is willing to put energy and money in an incremental, adaptable redevelopment scheme, while respecting its original principles. A small foot note here though is that due to current planning regulations only a much smaller replacement would be allowed after demolition. Still, a highly interesting and striking piece of late ‘socialist’ architecture, that otherwise might have been written off after years of vacancy, is currently finding new use as a thriving cultural business location. This makes it also a great example of the fact that creative solutions and dedicated people will be key in dealing with Budapest’s vacancy issues. Top image by Flickr/Zsolt Andrasi. 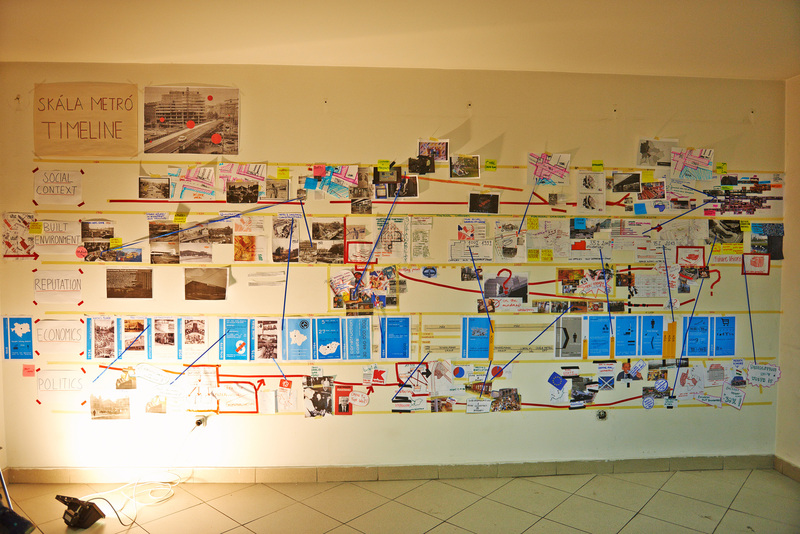 The final timeline of the Skála Metró complex, on which this report is based, created by the workshop participants.